These lithium replacement batteries may be the only one necessary during the lifetime of the robotic vacuum cleaner. 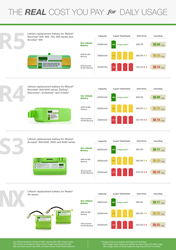 Priced for significant savings, these batteries provide the lowest cost per usage, best performance and longest operating time for both old and new iRobot Roombas®, Scoobas® and Neato® XV Series. Lithium Power, Inc.‘s worry-free, lifelong battery, is the solution for your robotic vacuum needs. Lithium Power, Inc. offers an innovative breakthrough in lithium technology with their fully compatible replacement batteries for iRobot Roomba®, Scooba® and Neato® XV robotic vacuums. 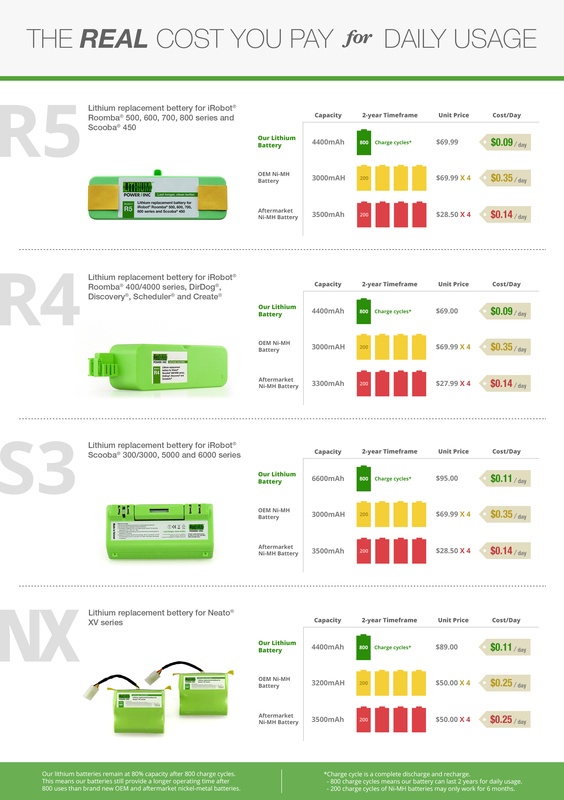 They last four times longer than the original equipment manufacturer (OEM) and all aftermarket nickel metal batteries. Last longer, clean better. Many users report back to us or write reviews stating that their robotic vacuum’s trash bin collects way more dust and dirt by using our battery. The operating time of their vacuum is even longer than when the robot was brand new! Moreover, the longer battery life means users may not need to buy another replacement battery for the rest of the robotic vacuum’s lifetime. For pet owners and daily users, the advantages of having a long-lasting lithium battery in a robotic vacuum cleaner or floor scrubber cannot be understated. See our cost-per-performance ratio, which proves the value of our lithium battery versus the traditional NiMH, and demonstrates how today’s breakthrough technology improves quality of life. Why transition to lithium batteries? Serves product’s lifetime. The last replacement battery you may need to buy. The lowest cost per usage, longest operating time and longest battery life. Operates multiple times longer to collect more dirt, dust and grime. Fully compatible with the original charger in all Roomba® series, Neato® XV series and the Scooba® 300/400 series. It is worry-free, plug and play solution. “Last longer, clean better,” says CEO Wilson Chan.